Small and portable, easy to taken to anywhere with folded size: 518*365*38.5mm ,4.6kg. You can use it when hiking, camping, to set the off-grid solar panel system for charge batteries of caravan, RV, boat or power the pump, etc. 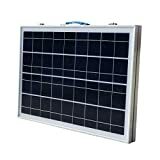 Good quality frame and powerful polycrystalline solar cells with 3A controller.